What can you make with a little bit of nothing? Quite a bit! 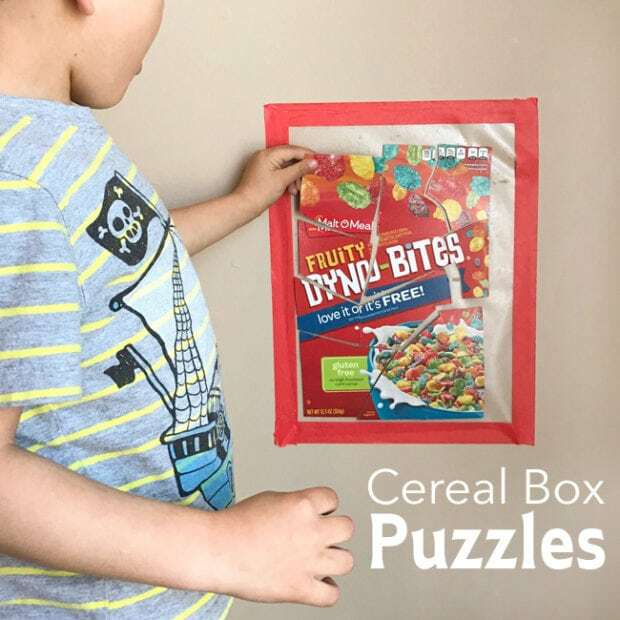 As you’ll see in these cute crafts to make out of cereal boxes, cardboard and imagination yield cool ideas for a party activity or fun at home. There are clever projects for matching games, maze ideas, city landscapes, puppets, guitars, mini pinatas, puzzles, a hobby horse, sailboat, pencil case, wallet, globe, and a cool light box art piece. How to feel good? Combine fun craft ideas with recycling. Kids will love learning How to Make Homemade Playdough. Keep little ones busy with 9 Footprint Crafts Boys Will Think Are Cool. Get hands and imaginations busy with these crafts for kids! Don’t throw away your empty cereal boxes. Instead, turn them into an awesome double decker toy car garage! This is the perfect craft idea to keep kids busily while stuck indoors on a rainy or cold day. Enlist them to help you build the car garage with two cereal boxes and toilet paper rolls to help build the excitement and anticipation. Then afterwards they will love to play for hours with their newly built upcycled creation. 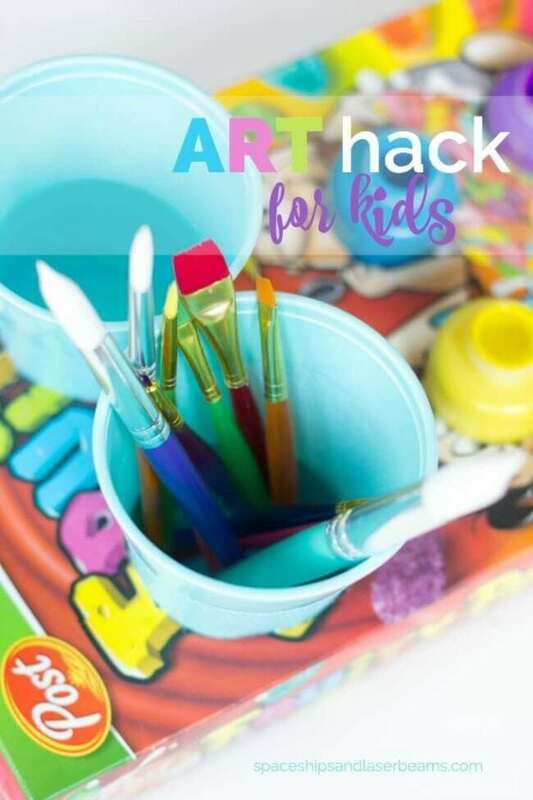 Check out this simple art hack that is not only super easy to make, but helps keep your art supplies in one place while creating those frameable masterpieces. Simply take an empty cereal box, cut out circles sized to fit plastic cups and paint bottles and get organized! Keeps the mess limited and will help make a great activity even better. Feed the penguin with this easy and fun game for kids made from a recycled cereal box, construction paper, and a few googly eyes! It is also a great way to practice skills and concepts with your kids. On the fish you can draw shapes, numbers, letters, or words. Let you kids feed the penguin the fish as you teach and review the concepts drawn on the fish. This homemade toy is a big hit for toddlers, and makes an easy do it yourself project on a quiet weeknight. The base of the game is made from an old cereal box, and you probably have the rest of the materials already in your craft cupboard. It may look simple, but this game will help your child practice fine motor skills and directional skills. Older kids could even make a more complicated version for themselves. 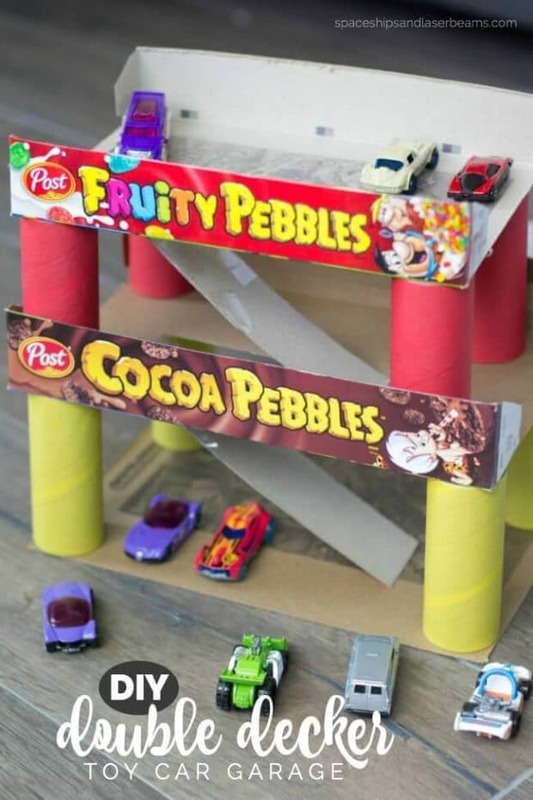 Make days of fun out of a few old cereal boxes with this easy cityscape craft. Let your kids’ creativity run wild, transforming any leftover boxes into recycled building, skyscrapers, house, and more. Create your own box city! Once your kids are done building, bring in some of their favorite toy cars, animals, and people to add to the fun and encourage imaginative play. Need an activity for a cold or rainy day that is made from items around your house? This puzzle can be made from any cereal box and gives them hours of fun. Attach some contact paper with masking tape to the wall to create a new space to work the puzzle all over the house. They will love trying to figure out the puzzle on the wall or kitchen. Grab some scissors and start creating those pieces. I always loved marble runs when I was a kid. It was so fun to design and test different mazes and race marbles through the finished designs. These cereal box marbles runs are super easy to make and kids are bound to love them. Follow the easy directions included in the blog post to create a marble run of your own using a cereal box, a few strips of tape, and of course a handful of marbles! Upcycle unused items around your house like old cereal boxes, paper towel tubes and even crayons to create this fun and imaginative guitar. 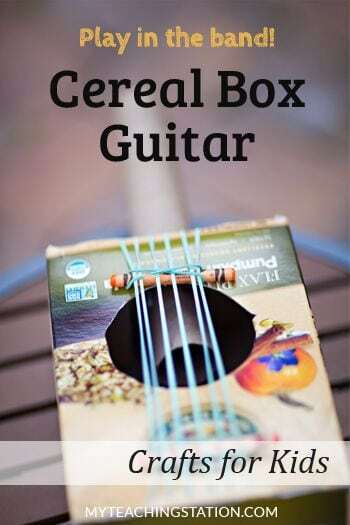 Kids will love personalizing the box to create their own custom guitar. Once it’s complete, gather the family for an awesome rock show! Save your books from dog eared corners and save your cardboard from the trash at the same time with this simple cereal box bookmark project. Simply pull out your colorful cardboard packages, flatten them out, and cut them into bookmark sized strips. Thread a matching ribbon through a hole in the top to finish them off. This craft is an easy one to make with your kids, and will inspire them to keep reading. Create your own memory style matching game with bright and colorful cereal boxes. This cereal box craft makes a quick and easy, educational matching game for preschool aged children. Open and flatten out your old brightly colored cereal boxes, choose about six different colors, and cut out 2 of the same size circles from each. Let your children turn over the pieces and start matching! Can you even believe that this ride on dragon hobby horse is made from an old cereal box and a plastic garbage bag? Me neither! This ride on toy makes the perfect weekend project and is the perfect craft to get your kids involved with. Dressing up and puppet props are a great way for children to develop imaginative storytelling, and it really is great fun. Have you heard of the KiX Interactive Adventure Boxes? The cereal box comes with all of the pieces necessary to explore a world of stories with your kids and take them on an excellent adventure. Each box is covered in adorable characters for your kids to pop out and construct, then all that is left to make this awesome recycled puppet theatre. This activity will have everyone’s imaginations whirling! Earth Day is the perfect time to talk to your kids about the environment and make a fun recycled craft. These recycled cereal box globes do just the trick! Strips are brightly colored cereal boxes are connected to create beautiful Earth-inspired globes that look amazing sitting on a desk or hung from the ceiling. How do you celebrate Earth Day? Piñatas are always a party favorite, no matter the ages or number of guests. Make piñatas even more fun by following this easy tutorial to create adorable, personal-sized piñatas for your celebration! All you need are cereal boxes, scissors, your favorite colors of crepe paper, and a few pieces of tape. These festive piñatas are easy to construct and so much fun to decorate. Fill them up with small treats like candies, party poppers, and confetti. The cool graphics and bright colors on cereal boxes are much too valuable to throw away. Transform your empty cereal box into something that you can store your valuables inside with this awesome food box wallet. With a little bit of elastic and some crafty hands, you will have a fun new wallet in no time. It also works great as a business card holder or gift card holder for kids. Upcycling is the name of the game with this fun and funky pencil holder DIY. This blogger recycles old cereal boxes and snack boxes by creating practical pieces perfect for at home or school. Print out the template then trace and score along the dotted lines for a super easy craft. When you are done, don’t let this project keep you boxed in. Try coming up with your own cereal box upcycling project. Show kids that recycling can be fun! With a bit of imagination, some glue and of course some empty cereal boxes, you can create this amazing Peppa Pig Puppet Playhouse. Head to Nick Jr. website where you can download the printable characters to complete your playhouse and have hours of fun. Set sail on the seven seas with this amazing mini sailboat made from a recycled cereal box, paper, and a few other materials. Customize the colors and design on your sails to make a personalized boat made just for you. The best part is that kids can do this project mostly on their own, with minimal adult help. Encourage your kids to let their imaginations run wild! Turn that cereal box into a puppet of the all-time favorite movie character, Shrek! All you need is a cereal box, some scissors, and some construction paper to glue on the box. Strips of green paper folded in half make the ears and a ring of green paper makes the nose. Put your hand in the box and have a fun chat with your new puppet friend. Not a big fan of Shrek? Use this tutorial to create another character or your very own monster.